Today 4.6.2 was released. It is the secod fix release for 4.6. That is two fix release in under a week for v4.6. And that are two much. Every release cost me a lot of extra work that I could have spent better. Also all the extra downloads and upgrade uses a lot of bandwidth and it is kind of annoying also for users to get update notification too often. The problem is that all bugs that was fixed in this two release also was in the BETA/ALPHA release, But nobody reported them. So please. If you see issues with the Beta/Alpha releases, specially crashes. Report them. Because if you do not report them then they might not be fixed. Also the standard crash reports that are sent are very limited. So one easy thing you can do to help is to increase the crash dump information that are sent. You find that settings under Core settings and in the "Misc" tab there is a Crash dump format setting. The Beta for the next version is now out. A lot of the things that was planed for v4.6 is not here because I have not had so much time to spend on Multi Commander that I thought. So what is new in 4.6 ? There is now support for Italian langauge. A big thanks goes to Aldo for creating this. Most of the new features are around the Picture Viewer. The image library used has been update and the viewer also support a lot of new functions that are access from the right click popup menu. 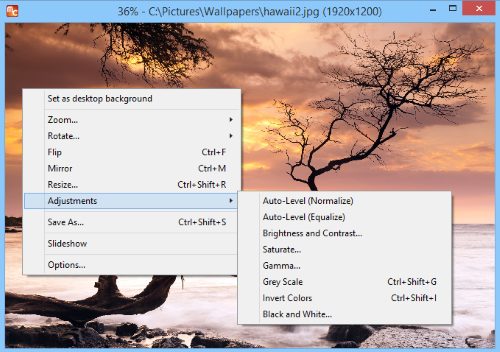 You can now modify the colors, resize image and also save the opened image into a new format. If you do color changes it will save the previous image in memory and you can undo the operation with Ctrl+Z.